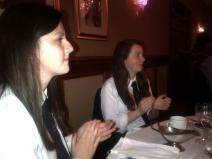 Year 12 pupils Elizabeth Blackwood and Deborah King were great ambassadors for Newtownhamilton High School when they were royally treated at the Gala Dinner organised by Newry Chamber of Commerce & Trade on 25th June 2014. Thanks to all staff in the Canal Court Hotel for the magnificent meal composed of Spicy Chicken Caesar Salad starter, delicious Roast Sirloin of Beef with peppered sauce main course and Steamed Chocolate Pudding with orange sauce dessert – all finished off with tea or coffee and mints. Entertainment was provided by Carla & Barbara (Opera singers from “The Voice”). It was indeed a special treat to be present at such a prestigious event, where the guest speaker was Rt Hon Peter Robinson MLA First Minister. 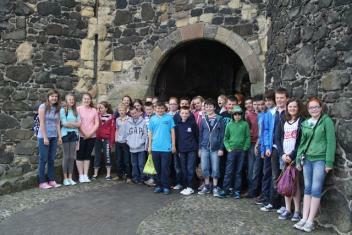 A great day was had by all on our annual Scripture Union Trip. 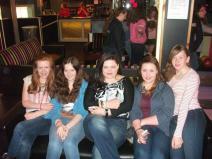 Fun was had at the Ten Pin Bowling and Lazer Quest with Madison West winning a prize for the highest score at bowling. 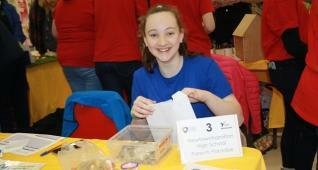 Pupils then went for lunch and enjoyed spending lots of money shopping in Newry. 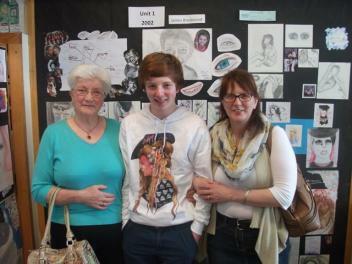 Former Newtownhamilton High Teacher Mrs Beattie came back to join us for the day. 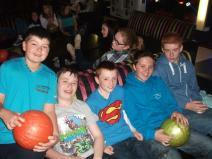 Staff and pupils alike had a great time away. 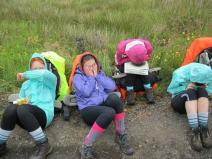 The Gold Duke of Edinburgh's Award Expedition continues in the Antrim Hills, where the pupils are exploring the history and land use in the Glens of Antrim. 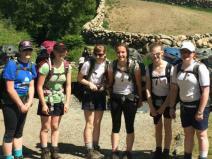 Currently on Day 3 of their 4 day expedition, the pupils remain upbeat and cheery, despite having approximately 70km covered in just over 2 days. There was also the fierce attack of midges last night at the campsite, which alone was testing for the group! Pupils are enjoying the wonderful, idyllic scenery of the Antrim Glens, noticing the difference in Antrim and the Mournes. At times the land may be flatter, however there certainly aren't as many clear cut paths here in Antrim, as indeed Mr Chambers and Mrs Graham have discovered too, having made their way through numerous bogs to meet the group yesterday! 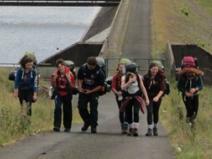 The pupils are making excellent progress today, demonstrating their fine navigation skills as well as fantastic levels of fitness. They really are to be commended on both, allowing their assessor to have firm confidence in their capabilities. 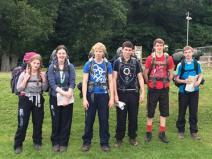 Duke of Edinburgh Expeditions at this level certainly aren't a walk in the park or for the faint hearted! 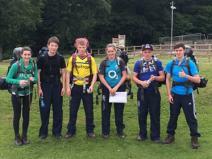 24/06/14 - Further success for Bronze Duke of Edinburgh's Award! 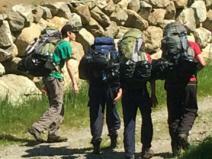 Three more groups, a total of 15 Year 10 pupils, have successfully completed their Bronze Expeditions in the Mourne Mountains last week. The wet and windy weather conditions experienced during their practice journey certainly didn't deter any pupils, and thankfully the sun shone for the entire 2 days during the assessed journey, allowing the pupils to enjoy the wonderful scenery of Mourne. 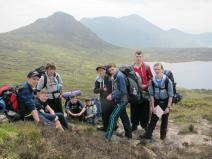 All 3 groups began their trek from Meelmore Lodge, following the Mourne Way, to camp at The Rocky Mountain Centre. Everyone worked well to get the tents erected, before 'tucking in' to feasts of pasta and noodles, along with the copious amounts of sweets and chocolate. The final leg on Day 2 took the groups through Kilbroney Forest Park, where the minibus was then once again pulled up and ready to transport everyone safely back to Newtownhamilton. The pictures speak for themselves, showing the smiling faces and the enjoyment our pupils get from this worthwhile experience. 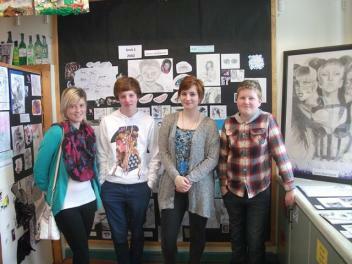 Assessor Mrs Sandra O'Hara from St. Mary's High School Newry congratulated the groups on their success. 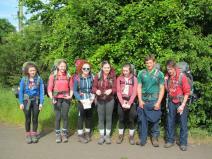 Mr Chambers and Mrs Graham also commend all pupils on their skills in navigation, team work and fitness. Well done. 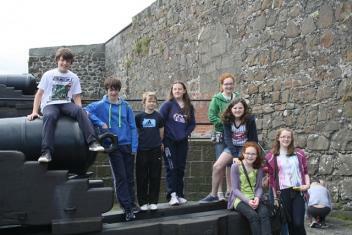 Year 8 pupils enjoyed a visit to Carrickfergus Castle on Friday 20 June where they were able to take a step back in time and explore one of Northern Ireland’s most striking historical monuments. They also considered why it is important to preserve such historical sites for future generations. 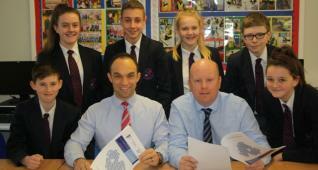 Our thanks go to Mrs Reid (Head of History) and Mrs Ferris for accompanying our Year 8 pupils. Since September our Year 10 History pupils have had the wonderful opportunity to work closely with fellow pupils from St Paul's High School in Bessbrook to commemorate the Decade of Anniversaries. Through PEACE III funding, pupils and History teaching staff from both our schools have established new friendships and strengthened relationships which we intend to build on over the next few years. Our collaboration culminated in a fantastic funded trip to Carlingford Adventure Centre on Tuesday 17 June where pupils and staff teamed up - taking part in kayaking and Laser Combat in Ireland's largest Laser Combat Arena! 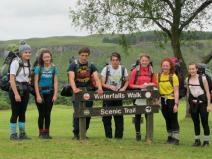 The weather and the scenery was breathtaking with everyone thoroughly enjoyed themselves as the happy snaps show. Our thanks go to Mrs Reid (Head of History) and Mrs Flanagan for accompanying our pupils. On Thursday 5 June, our Year 10 pupils were delighted to have the opportunity to attend a lecture on the Holocaust taken by an educator of the Holocaust Educational Trust (HET). 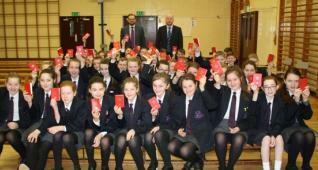 St. Paul's High School in Bessbrook kindly hosted the event which was funded by PEACE III. Our two History Departments have been working closely together over the year and this collaboration helped to consolidate our pupils' understanding of the Holocaust. 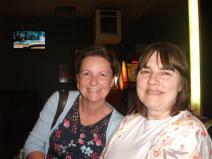 Our thanks go to Mrs Reid (Head of History) and Mrs Robinson for accompanying the pupils to the event. 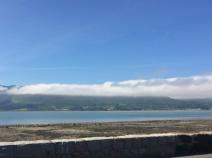 Our Silver expeditions have continued this morning, setting off in the sweltering heat from Rostrevor. 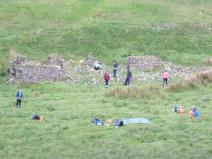 2 groups have started - hoping to make their way to camp at the Hen Track before the sun cream runs out! It's not just Brazil that will be alive and kicking this weekend - The Mournes will certainly be alive with the sound of....expeditions! Yes, now that exams are finally over in Newtownhamilton, expedition season has begun. 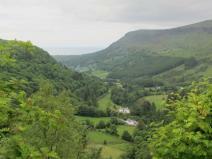 Two silver groups (12 pupils) have set off through Kilbroney Forest Park, Rostrevor this morning, under the watchful eye of Mr Chambers. 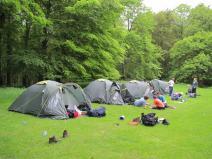 Both groups are hoping the rain stays away and will look forward to camping at the Hen Track later this evening. What a way to celebrate the end of GCSE exams! 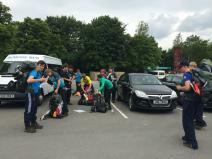 A total of 46 pupils will be completing their expeditions over the coming weeks, both in The Mournes and The Antrim Hills. The expeditions include bronze, silver and gold levels. 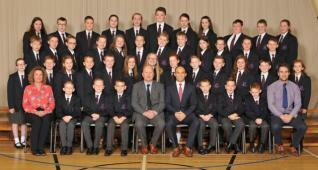 Pupils and staff look forward to safe, fun filled adventures - and a little sunshine would be a welcome addition! The sun was out and shining on Newtownhamilton High School on Friday 13 June as pupils, parents and staff enjoyed an extended break for the official handover of 6 outdoor picnic tables that sit on the patio area outside the recently constructed state of the art canteen. The tables were donated to the school by the Student Council, School Association and an anonymous donor. School Council Co-ordinator Mr D Sloan explained “Our pupils requested some outdoor seating and so decided to contribute to the cost of the picnic tables from money which they raised at their successful breakfast morning in April“. 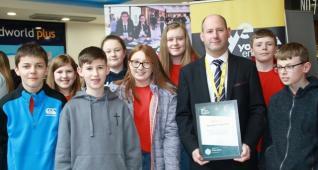 Principal Mr G Mullan expressed his delight at how the whole school community continues to pull together when he stated “A big thank you goes to our School Association Members, Student Council representatives and the generosity of parents for this wonderful gesture which our pupils will enjoy during their morning and lunch breaks. 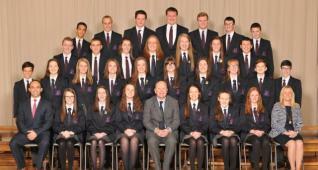 This is a further example of what can be achieved at Newtownhamilton High when pupils, parents and staff work together”. 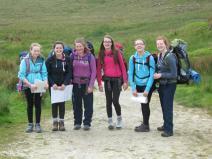 The weather was changeable in the Mournes as Year 10 pupils successfully completed their Bronze Award practice expedition on Wednesday 28 and Thursday 29 May 2014. Mr Sloan and Mr Chambers were very impressed with how everyone coped in the tough conditions. 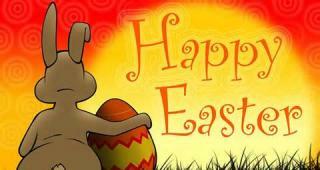 Well done to all those who took part! 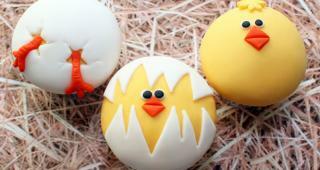 More photographs can be found on the gallery section of this website. 2013 Prize Winners are asked to return all cups and shields to the school as soon as possible so that they can be engraved and cleaned for Prize Night in November. Pictured is Victoria Gray with trophies that she was awarded during the 2013 Prize Night celebrations.